Then tear off 4 sheets of parchment paper each one about 12 inches in length. Place 1 fillet on each sheet. Then seed and finely chop the tomatoes. Toss those on top of the cod along with the thyme leaves, fresh squeezed lemon juice, olive oil spread, paprika, salt, and pepper. Once the ingredients are evenly distributed fold the paper over to form a packet and twist and fold the edges, crimping tightly. If you need to secure the edges to eliminate gaps, feel free to use toothpicks. Place the four packets on a large baking sheet and let them bake for about 12 to 15 minutes. The packets will puff and the fish should no longer be translucent inside. Watch out for the steam when opening up the packets. Lastly, slide each packet onto a plate and serve. Enjoy. 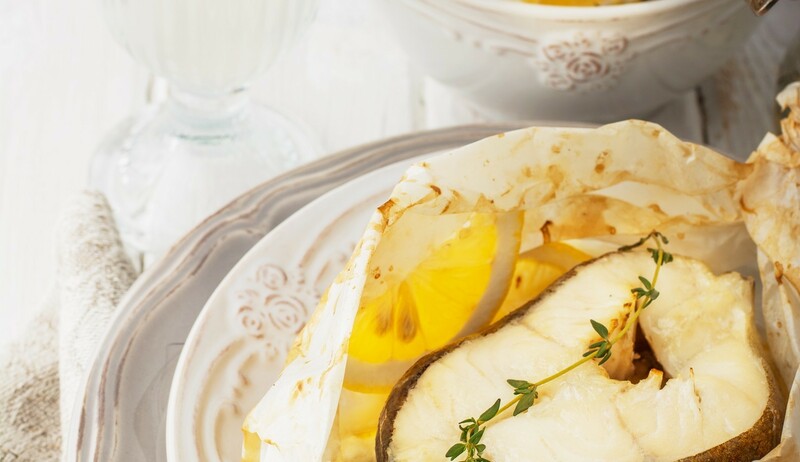 this dish is delicious, have made it several times using chilean sea bass, it has become a weekly staple. How do you make the olive oil spread??? How do you make the Olive Oil Spread??? ?